This luxury, stain-resistant tablecloth is immune to messes like wine and liquids. 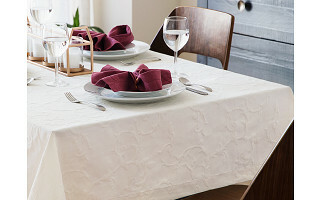 Even though it is as nice as any tablecloth you’d use on a holiday, the fine linen fibers have an eco-friendly, fluorocarbon finish that keeps stains from setting in. So it’ll look just as great even after you’ve dined. After your gathering, wipe it down for next time. If you want to toss it in the washing machine (but you shouldn’t need to very often), go ahead. Just note that machine washing will wear off the stain-resistant coating gradually—after about 10 washes. The two Founders let their backgrounds inform the final design: Verda Deeskinazis’ love of home décor and Tania Kooros’ knack for big, Persian, home cooked meals. They wanted to create a beautiful centerpiece for people to gather around without worry. Now you can put out a beautiful spread without worrying about stains. Hello Grommet fans! We are Verda and Tania, co-founders of Mode Living. We are so excited to introduce to you our luxury easy care table linen collection! 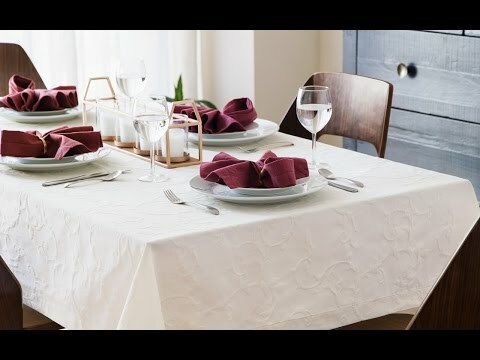 As we're both passionate about entertaining, we know how difficult it can be to clean up after a dinner party, or when your favorite linen gets ruined, so we created our collection of luxury easy care linens that are modern, versatile, and (best of all) resistant to wine and other liquids! (All machine washable, and some don’t even need any ironing!) So you can always throw those dinner parties, or simply enjoy a beautiful meal, without the hassle of cleanup! @Ephraim Please check out the Esse Collection, prices start at $50 and up. This is the best price point you can find for the natural look and feel of the tablecloth, and the easycare feature. In the pictures it looks like linen, but in real life does it look like linen or expensive paper? What does it feel like? what is the effect of the fluorocarbon component on the environment both while sitting on the tablecloth and then as it is released in the washing machine? @rae The fluorocarbon is an eco-friendly compound applied in the dyeing to provide water and liquid repellency. All our products are Oeko-Tex certified, meaning they do not contain any harmful chemicals or dyes. @Tania thanks for your prompt response! @rae Where is this tablecloth made? Is it a USA product? @Shirley We manufacture our products in Turkey, but we are based out of Houston. How does it do with oil stains which is my biggest problem? Also will the stain resistant treatment wear off with washes? Thanks. @Helena Oil stains are a little more tricky, apply salt immediately and spot treat before you clean. This is the best stain resistance we can do without losing the natural look and feel of the fabric. After 10 washes, the stain resistant treatment will start to wear off, and the product will be come more of a normal tablecloth. The hope is with the treatment in the fabric, you will not have to wash it that often! What size would you suggest for a table that is 36 x 56? @Kathleen We recommend using the Aspen or Esse tablecloth in a 54"x72" size. i don't have a space to flat dry a tablecloth.....why can't it go in the dryer? @Patricia For best long term usage we recommend to flat dry, but it can also go in the dryer. We recommend to tumble dry low, and depending on the fabric you are getting, it may need some ironing on the low-medium setting. Is the fabric actual linen made from processed and spun flax or is it a synthetic fabric with a linen look and feel? @Joanne We have different types of fabrics, 100% Polyester (like Esse style) but we also have Poly-cotton blends like the Miami, Cartagena, and Aspen styles. We do offer 100% Pure Linen and a Linen Cotton Style (Lima) on our website. I am in the senior housing management industry. I want to go to a linen look with the features you are speaking of and there are a good deal of products out there. We are budgeting for this now for the upcoming year. How does your product compare to what is available in the hospitality business and how would the pricing adjust for volume purchases? @Frank Our product is higher quality, and has a more luxury look and feel to it compared to the other stain-resistant tablecloths in the market. We actually have done linens for a few nursing homes, and have a good idea of what they are looking for. Feel free to reach out to us at [email protected], and we can help you with what you need. We will need to get an idea of sizes and quantities so we can help. This luxury, stain-resistant tablecloth is immune to messes like wine and liquids. 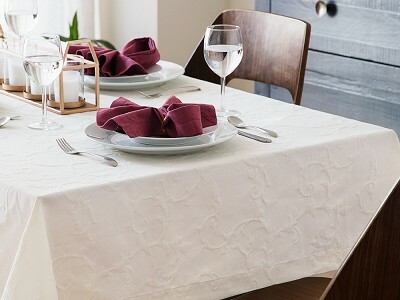 Even though it is as nice as any tablecloth you’d use on a holiday, the fine linen fibers have an eco-friendly, fluorocarbon finish that keeps stains from setting in. So it’ll look just as great even after you’ve dined. After your gathering, wipe it down for next time. If you want to toss it in the washing machine (but you shouldn’t need to very often), go ahead. Just note that machine washing will wear off the stain-resistant coating gradually—after about 10 washes. The two Founders let their backgrounds inform the final design: Verda Deeskinazis’ love of home décor and Tania Kooros’ knack for big, Persian, home cooked meals. They wanted to create a beautiful centerpiece for people to gather around without worry.